GSRTC Recruitment 2019-20 – Apply through Online for 20 vacancies of Junior Engineer/ Supervisor posts: Gujarat State Road Transport Corporation recently released a job notification on its official website ojas.gujarat.gov.in for Junior Engineer/ Supervisor posts. Candidates are allowed to apply for GSRTC Recruitment 2019 from 21.12.2018 to 04.01.2019. Candidate can find the further details like Eligibility Criteria, Age limit, the Selection process of GSRTC Recruitment 2019 on the below page. Job Seekers can apply for the post through the Official page ojas.gujarat.gov.in and careers99.com. GSRTC Notification 2019 announced for the vacancies of 20 Junior Engineer/ Supervisor on its official website ojas.gujarat.gov.in. Eligibility criteria, Educational Qualifications, Age limit, Selection process, Pay scale and other required details are mentioned below in careers99.com. So candidates who are interested and eligible can apply Online before the last date of the Notification i.e., 04.01.2019. 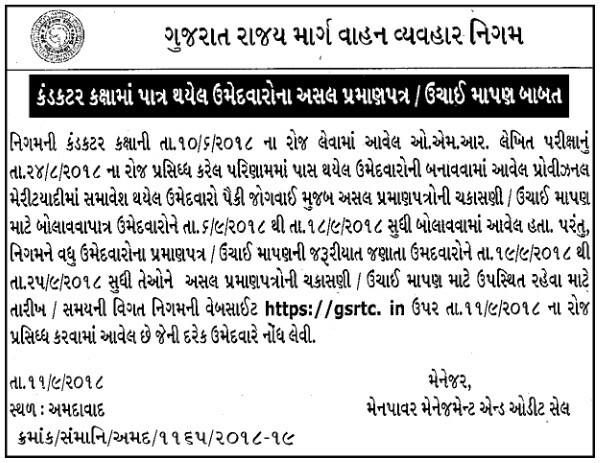 Interested Job Aspirants who are ready to apply for Gujarat State Road Transport Corporation 2019 Notification must possess the below-given Eligibility Details. Selected candidates will get Rs.14,500/- Per month by the Recruiting Organization. GSRTC Recruitment 2018 – Apply Online for Driver & Conductor Posts: Gujarat State Road Transport Corporation (GSRTC) has advertised a notification for the recruitment of 2930 posts of Driver & Conductor vacancies. Eligible candidates can apply online soon. Other details like age limit, educational qualification, selection process & how to apply for GSRTC Jobs are given below. Selection of Candidates for Driver & Conductor posts will be done as per following stages- based on competitive written exam & computer proficiency test.